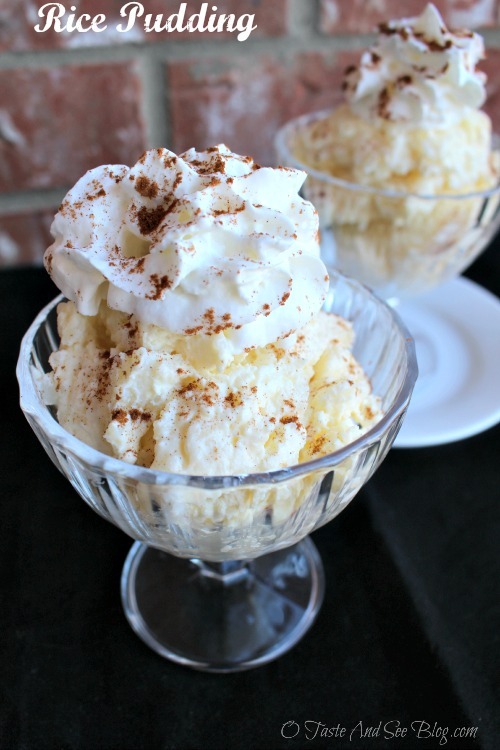 This is not the first time Rice Pudding has been on the blog. In fact, it’s rather infamous. Sadly, last year it made the Top 5 Epic Fails! This year…SUCCESS! Rice Pudding is one of “Grandma’s Recipes” that my husband and I really love. It’s one of our once a year treats that I make for New Year’s. After the Rice Pudding Fail of 2013, I determined to make this while Grandma was here so she could see what I was doing wrong. Mine always seemed to turn out more like a thick (albeit still yummy) soup rather than pudding. We were fortunate enough to have my in-laws with us for several weeks (on a couple of occasions) this year so even though we didn’t need anymore dessert, we made Rice Pudding. She was able to determine right away where I was going wrong. YEA! Now I can pass the recipe along to you…and give you a head’s up on how to make it perfectly! For this recipe I’m using Imperial Sugar, from Sugar Land, TX…the oldest extant business in Texas! It’s been operating continuously at the same location since 1843…over 150 years! It’s the perfect southern ingredients for the perfect southern dish! One note…most Rice Pudding recipes start with left over rice and they are good, but this one starts by cooking the rice in half and half, helping to produce the most rich and creamy pudding you’ve ever tasted. Plan plenty of time to make this recipe and don’t get in a hurry. The end product will be WELL worth your time and patience. *This is going to take some time. Turn heat to medium or med-low. If it heats too quickly a brown film will form on the bottom of pan and be stirred in leaving a scorched taste and unattractive brown clumps in rice. *This is called “tempering” the eggs. Adding eggs to a hot mixture can cause eggs to cook on contact giving you scrambled eggs….NOT good! Spoon into individual dishes, sprinkle with cinnamon and top with a generous amount of whipped topping! When ready to serve, spoon into individual dishes, sprinkle with cinnamon and top with a generous amount of whipped topping! *Boiling half and half is going to take some time. Turn heat to medium or med-low. If it heats too quickly a brown film will form on the bottom of pan and be stirred in leaving a scorched taste and unattractive brown clumps in rice. **This is called “tempering” the eggs. Adding eggs to a hot mixture can cause eggs to cook on contact giving you scrambled eggs….NOT good! When do you add butter and vanilla? I see I put it in the step by step instructions but somehow managed to leave it out of the printable version. Thanks for bringing it to my attention. They both go in at the end. After the mixture has cooked on low for 5 minutes, while stirring constantly, remove from heat and add the butter and vanilla. Nevermind I saw it was written at the top. Do we stir 1/4 cup of the hot rice into the eggs? Or 1/4 of the whole pot? Good question, Kaelynn. Stir in about 1/4 of the pot of hot rice into the eggs. Adding hot things to eggs gradually will keep the eggs from turning into scrambled eggs….yuck! ABSOLUTELY PERFECT! With your help I have finally made the rice pudding of my dreams. I cannot wait to share it with friends. Thanks so much for sharing this wonderful recipe with tips! Thank you for stopping by to let me know! Glad I could help.